What has the ability to turn your normally cheerful baby into a grouch? One of the most likely answers is teething. Teething can begin as early as three months and you will likely see your baby's first tooth sometime between four and seven months. Drooling - You may want to keep a good supply of bibs on hand! Irritability - Crankiness is common and it may be difficult to console a teething baby. Swollen gums - Your baby's gums are likely to become engorged before the teeth emerge. Waking at night - Babies who were sleeping well at night may now awaken a number of times. Biting and chewing - Teething babies often gnaw on everything that they can get into their mouths -- toys, teething rings, and your fingers! Rash - Some babies experience a bit of a rash or chapped skin on their faces, necks, or chest resulting from excessive drooling. Try to keep baby as dry as possible and coat irritated areas with a light layer of petroleum jelly to aid healing. Diarrhea - Although not all babies experience tummy upsets when teething, some do. Teething-related diarrhoea is usually mild and clears up quickly on its own. Consult your baby's doctor about persistent diarrhoea, since it is not likely to be due to teething. Fever - Some babies run a slight fever when teething. Administering acetaminophen or ibuprofen will bring down fever and relieve pain. Again, it is best to check with your baby's doctor about specific concerns regarding fever and the administration of medication. Typically, the first teeth to emerge will be the central incisors, located on the bottom, in front. The four upper front teeth (central and lateral incisors) usually follow within a month or two, and about a month after their appearance the lower lateral incisors (on each side of the center two teeth) will come in. Once the first eight teeth are in place, a few molars will appear and then the eyeteeth. By the time that babies celebrate their third birthdays, they usually have 20 primary teeth. While this scenario is most common, each child varies a bit and this is usually no cause for concern. If you have questions about your child's teeth, it is a good idea to consult with your GP or a paediatric dentist. Each of us has a different tolerance for pain, and babies are no exception. Some babies sail through teething with barely an outward symptom while others appear to be in considerable pain. In addition to the pain relieving medications mentioned above, there are several other things that can help to make your baby more comfortable. 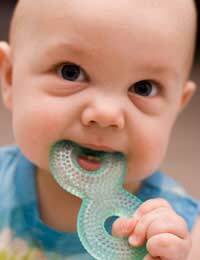 Teething gels are widely available and may provide temporary relief. A good supply of icy teething rings will come in handy since cold helps to numb the gums. Many parents find that giving babies a frozen, wet washcloth to chew on is the best solution. Old fashioned methods of easing the discomfort associated with teething are often unsafe. Never attach a teething ring to a baby's clothing or tie it around baby's neck with a ribbon as both can cause strangulation. Also, never place an aspirin on a baby's gums since aspirin is not safe for babies and children. The same can be said for the age old custom of rubbing whiskey on a baby's gums. This is a definite no! Start a practice of good oral hygiene as soon as your baby's first tooth emerges. Clean it at least twice a day using a soft washcloth or soft, baby toothbrush. There is no need for toothpaste; clear water will do just fine. Once your baby is old enough to follow instructions, you may choose a fluoride toothpaste, but use just a pea sized dollop and supervise brushing so that your child learns to spit out the toothpaste, rather than swallowing it. You should schedule an initial visit with a paediatric dentist before your child's second birthday. The dentist will help your toddler to learn proper brushing and flossing techniques, assuring a bright, healthy smile!